I'm glad you liked it! I often interchange between chicken and vegetable stock, I usually just grab whatever is closest I also only use the mint if we have it in the garden, because buying herbs for garnish is crazyexpensive to buy by the bunch. 1. Rinse quinoa and set aside to drain. 2. Heat the oil in a large saucepan over medium-high heat. Add the onion and garlic and cook, stirring frequently, until the onion is tender. 3. Add stock, water, tomatoes, lemon juice, basil, salt and pepper. Cover and bring to a boil. 4. Stir in the quinoa, cover, reduce to low heat and simmer 10-15 minutes until most of the liquid is absorbed. 5. Increase to medium heat and stir in broccoli. Cover and cook 5-7 minutes, stirring occasionally, until broccoli is tender. 6. Transfer to a serving bowl and garnish with the parsley, Parmesan and almonds. I think cooking the quinoa in water/stock that is already seasoned heightened the flavor. This recipe made about 5 cups, and I calculated a 1/2-cup serving to be ~120 calories (the paper says 148 but I didn't use cheese), 4 g fat and 5 g protein. I had some leftover cooked (but unflavored) quinoa from another recipe that I had stuck in the fridge. Last night I heated it and then drizzled some olive oil and salt and pepper on it, and it was very tasty. Holy moly, that recipe sounds gooooooddd! I'm gonna try that this week! The prep work takes a little while (I need to get a garlic press), but once that's done it's pretty easy -- all one pot. I think maybe some diced carrots would go well in this and may try adding them next time. Millet is another favourite of mine. It's great in chili. I'll write up a recipe when I've woken up a bit. I've never had Spelt in grain form but have pasta, pizza bases and cereals made from it. It has a very wholesome and earthy flavour. It is available here in health food shops like Wholefoods, Planet Organic and the larger Holland and Barret stores. To anyone who has used red or black quinoa, is the cooking method any different? I wanted to try them but only bought a little of each since they are double the price of the white quinoa. I made the pilaf recipe again tonight using equal parts red, black and white and it took 6 or 7 extra minutes for the water to soak up. I doubled the recipe, too, so it's possible I was doing too many things at once and added too much liquid. Or maybe I had the heat turned down too low when simmering. Also, the texture seemed a little grittier than usual (maybe that's characteristic of the red/black??). Made this tonight. I'd probably cut the lemon juice in half if I made it again, although the cumin (which I'm not sure about as a flavor here) helps to cut some of the tartness. I think I prefer something more traditional with bulghur and cukes, but I made this since I had so much quinoa. Recipe under the spoiler. Per cup is ~115 cals, 2g fat, 6g protein. In a medium-sized bowl, soak the quinoa in cold water for 5 minutes. Drain and rinse under cold running water. In a medium saucepan, combine the soaked quinoa and water and bring to a boil. Reduce the heat and simmer, covered, for 15 to 20 minutes, or until just tender. Drain, reserving the cooking liquid. In a large bowl, toss the quinoa with the tomatoes, parsley, mint, green onions, lemon juice, and cumin. Season to taste with pepper and salt. Chill and serve on a large serving platter with the romaine lettuce leaves and garnished with the tomatoes. If you can get them, yellow “cherry” tomatoes make a very striking color contrast. To make the salad more moist, add some of the reserved quinoa cooking liquid when you combine the quinoa with the vegetables and cumin. I'm curious about teff (particularly the nutritional component). I couldn't find the whole grain where I usually shop but did find teff flour. I didn't buy it because a small bag was $6.50, but maybe I will if I can't find it elsewhere. It had a recipe on the bag for peanut butter cookies. I may try to see if I can find an Ethiopian market that sells the grain. in my experience they all cook at the 15 minute mark - i put in plenty of water and then drain later in a fine colander when they're cooked. yikes - twice the price of regular quinoa?! the black quinoa sounds good though. ooh, and i LOVE tabouleh - though I agree, the traditional recipe is hard to beat. Finally got around to cooking up some steel cut oats tonight. They were thicker and chewier, but I didn't think they tasted any different than rolled oats (they're supposedly nuttier). Still been on the lookout for teff. Black rice!! It's actually more purplish than black, and it has antioxidants found in blueberries & grapes. Looking forward to trying it out with some asian dish. ^ It's yummy but watch out as it can stain whatever you cook it in purple. yess my mother uses it occasionally and told me the same thing. apparently the color is so strong they're considering using it for artificial colors in soda! 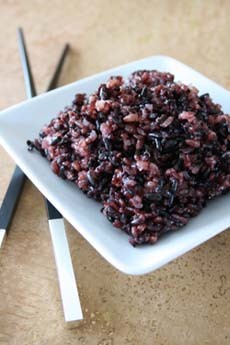 Roast the black glutinous rice in a frying pan on high heat. By doing this, it will release the nutty aroma of the rice. When the rice is dancing in the pan, it is ready. Put the roasted rice into a pot, wash and rinse thoroughly. Fill half the pot with water, cook over high heat. Add palm sugar, stir until dissolved. Add white sugar to taste, stir until dissolved. Once ready, remove from heat. Pour the porridge into a small bowl, add a few spoonful of coconut cream on top. Ready to serve hot, enjoy! "Never build a dungeon that you cannot get out of." I finally found whole teff about a year ago and tried it. I just cooked it and poured it in a Pyrex dish to cool. It firms up into a cake, and I break off pieces to reheat and drizzle with agave nectar for breakfast.